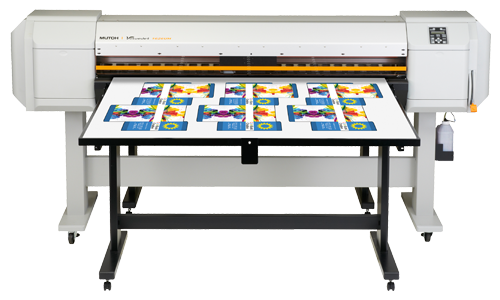 The ValueJet 1626UH 64” (165 cm) wide LED UV hybrid printer will deliver high quality prints on a variety of roll and rigid media up to 15 mm thick, including ABS, Alu-board, PC, PE, PET, PMMA (acrylic), PP, PS, PVC, uncoated Tyvek® and glass. The VJ-1626UH allows printing on a wide array of clear media for graphics that stand out. With layers of varnish, you can moreover create special gloss patterns. An energy-efficient latest generation LED UV lamp ensures ultra-sharp, safe & ready to use prints. Its reduced working temperatures also allow printing onto heat sensitive substrates. The ValueJet VJ-1626UH will produce high quality graphics for short viewing distances such as trade show graphics, POP, customised interior decoration, small lot packaging prototypes, banners, posters, etc.